Originally rom a now completed listen on Reverb.com, today’s pic arrives via matrixsynth, where you can see more pictures (sans cat). 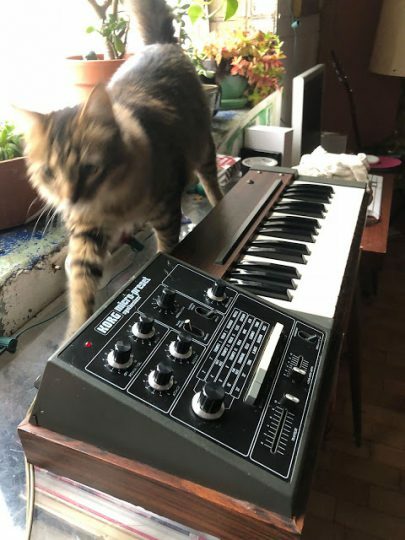 The Korg Micro Preset synthesizer is a curious late 1970s beast with a slightly bizarre matrix of pre-set sounds, including woodwind and similar noises and a keyboard all housed in a wooden box! It’s a 32-note monophonic preset synthesizer with 6 push-button presets including voice, synth1, synth2, brass, string, and wood. Its single-oscillator design has only rudimentary decay/release envelope controls and no access to the guts of the sound generation stuff. Once you’re past the outward appearance, a bit of probing will reveal a noise box that sounds remarkably similar to the MS-10 at times. There is a lot of fun to be had with the ‘traveller’ control, a sort of filter and resonance control rolled into one, offering interesting squelchy acid-style bass run effects. In fact, like the MS-10, bass is the best of what you get out of this guy along with lots of other useful noises. Add N To (X), The Human League, OMD, Jean Michel Jarre, OMD, Pop Will Eat Itself and Brian Eno are thought to have used the Micro Preset. Posted on January 22, 2018 January 22, 2018 by catsynth	This entry was posted in Cats, Synthesizers and tagged analog, cat, korg, matrixsynth, Synthesizers. Bookmark the permalink.